Figure 1: Schematic of the MEXT-coordinated advisory and working groups. The Human Resource working group has just held its last meeting on Monday, 20 June, this week, and the activity progress is summarised in Fig. 2. The working group has been chaired by. Prof. Takayoshi Nakano (Director of Research Center of Osaka University, RCNP) and composed of ten working group members from academic and industrial fields in Japan. I have been one of the members and I was in charge of reporting the ILC human resource plan described in the ILC Technical Design Report and the human resource preparation plan described in the KEK-ILC action plan (announced in the KEK news in Jan. 2016). Dr. Lyn Evans, as the former Project Leader of the CERN-LHC accelerator project, was specially invited for the hearing of the CERN-LHC accelerator construction experience, and Lyn much contributed with participation to the working group discussion in April this year based on his experience report (which I gave in his stead). It has been very well received in the working group discussion, as the fact that a similarly large scale accelerator project has been successfully built and operated in international cooperation centred at CERN for more than 20 years after its construction decision made in 1994. 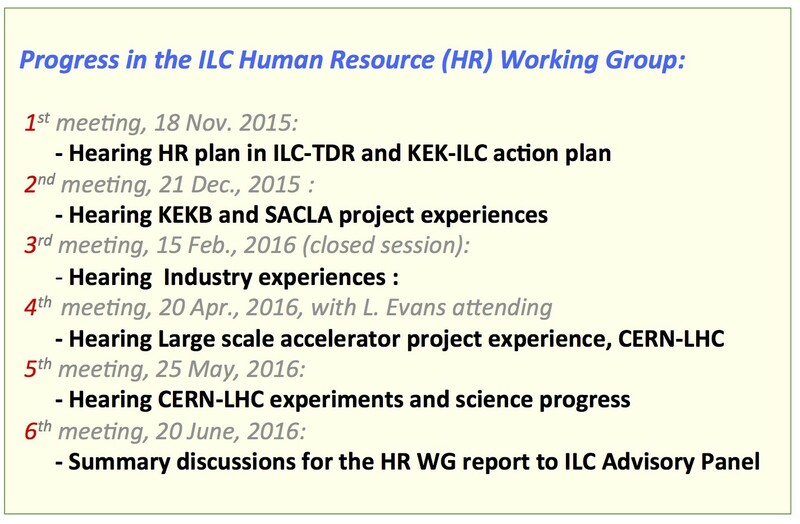 Activity progress of the human resources working group. The working group is about to submit the working group report to the parent (upper) committee, the ILC Advisory Panel, on 7 July. 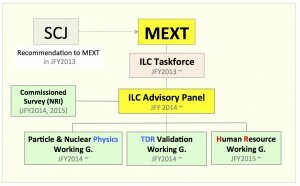 The draft report in preparation consists of four sections of 1) Summary of the human resource plan in the ILC-TDR and in the KEK-ILC action plan, 2) human resource status in academic and industrial fields to support large accelerator projects, in Japan and abroad, and the relation to the ILC project, and 3) scoping for the human resource necessary to be realised for constructing the ILC project with the international cooperation and domestic/regional support expected for international collaborators in Japan. 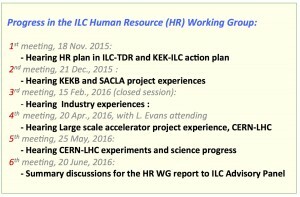 It should be noted that the CERN-LHC experience as a fact is well reflected into the report, as an important outcome from Lyn’s participation and support the discussion in the working group meeting. The working group report is to be discussed in the next ILC Advisory Panel meeting and to be announced in public afterwards. It is expected to be an official and open document, soon after also to be translated to English. I am hoping the working group activity and the report will be useful and constructive for the ILC project towards the green light to be reached.